While many associate the word “hotel” with that of our modern day dwellings featuring conveniences such as TVs, minibars, spas, and more, hotels have been around for much longer than that. The word “hospitality” is a derivative of “hospice” which loosely means “a place of rest for travelers and pilgrims.” Since the development of early civilizations, hotels have been a part of society – we have seen evidence of hospitable facilities since early biblical times. Travelers all over the world have sought a hospitable place to eat and sleep and while they did not offer the luxurious conveniences that hotels today offer, they were hotels all the same. The Greeks first developed thermal baths in various villages that were explicitly designed for rest and recuperation. Sometime later, the Romans built mansions for traveling government officials to provide them with accommodation. They then further developed the Greeks initial thermal bath design and introduced them to England, Switzerland and the Middle East. In the Middle Ages, the first establishments included monasteries and abbeys that offered shelter on a regular basis to travelers. Religious orders then built inns, hospices, and hospitals to better cater to travelers. As time went on, inns continued to multiply; however, they did not yet offer meals. These inns only provided basic services, such as the ability to change horses easily. 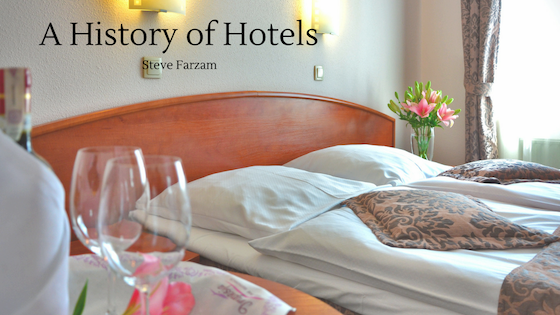 At the beginning of the 15th century, the law in France required hotels to keep a register. This spread to England, where additional rules were introduced for inns, where more than 600 were registered. The structure was relatively similar across the board – there was often a paved interior court that was accessed through an arched porch with bedrooms located on the two sides of the courtyard, the public restrooms and kitchen were found at the front, and the storehouse and stables at the back. In the 1760s, the industrial revolution expedited the development of hotels in mainland Europe, England, and America. These hotels were built with the sole intention of providing accommodation to travelers. The City Hotel, New York’s first hotel, opened in 1792 and the Royal Hotel was built in London at the beginning of the 1800s. Holiday resorts began to spring up and flourish along the Italian and French rivieras. Guest houses popped up in Japan, and government-run bungalows were developed in India. Throughout the years and through the 20th century, more and more corporations and business organizations took over ownership and management of larger hotels. Courses began being offered to provide basic hotel management training and have further developed and specialized over the years.